The Global Volcanism Program has no activity reports for Aneityum. The Global Volcanism Program has no Weekly Reports available for Aneityum. The Global Volcanism Program has no Bulletin Reports available for Aneityum. Oval-shaped, 17-km-wide Aneityum Island, also known as Anatom or Anetchom, lies SE of Tanna Island and is the southernmost of the Vanuatu Islands chain. Aneityum consists of two coalescing, dominantly basaltic Pleistocene volcanoes. Both the NW side of Inrerow Atamwan volcano and the SE side of Nanawarez volcano are truncated by large erosional cirques. Volcanic activity ceased during the uppermost late-Pleistocene to Holocene (Carney and Macfarlane, 1979). The Global Volcanism Program is not aware of any Holocene eruptions from Aneityum. If this volcano has had large eruptions (VEI >= 4) prior to 10,000 years ago, information might be found on the Aneityum page in the LaMEVE (Large Magnitude Explosive Volcanic Eruptions) database, a part of the Volcano Global Risk Identification and Analysis Project (VOGRIPA). There is no Deformation History data available for Aneityum. There is no Emissions History data available for Aneityum. 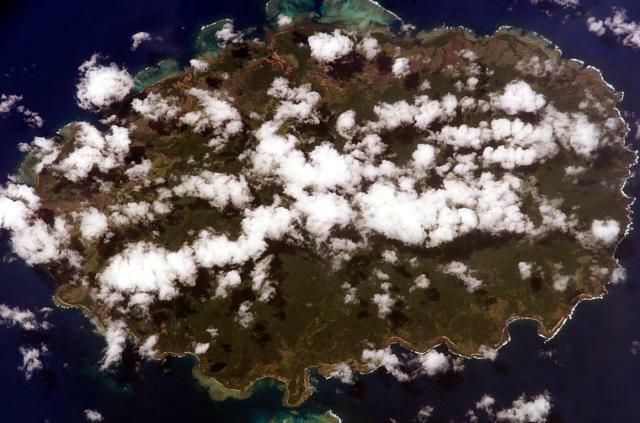 Clouds drape oval-shaped, 17-km-wide Aneityum Island in this NASA Space Shuttle image with north to the top. Aneityum, also known as Anatom, consists of two coalescing, dominantly basaltic Pleistocene volcanoes. Both the NW side of Inrerow Atamwan volcano (left) and the SE side of Nanawarez volcano (right) are truncated by large erosional cirques. Volcanic activity ceased during the uppermost late-Pleistocene to Holocene. Fringing reefs are visible on the northern side of the island. NASA Space Shuttle image ISS006-E-5732, 2002 (http://eol.jsc.nasa.gov/). There are no samples for Aneityum in the Smithsonian's NMNH Department of Mineral Sciences Rock and Ore collection. Large Eruptions of Aneityum Information about large Quaternary eruptions (VEI >= 4) is cataloged in the Large Magnitude Explosive Volcanic Eruptions (LaMEVE) database of the Volcano Global Risk Identification and Analysis Project (VOGRIPA).